Congratulations to Dr. Alla Zelenyuk on being asked to speak at the National Academies workshop titled Challenges in Characterizing Small Particles. This event will focus on the challenges of and possible approaches to understanding particles ranging in diameter from a few nanometers to tens of microns. Large gaps remain in our understanding of these ubiquitous particles, linked to environmental and health issues. Zelenyuk will be speaking about the challenges of analyzing and imaging particles. 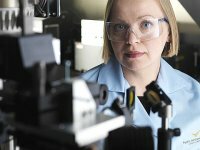 She was selected for reputation in developing and applying instruments to study the basic processes that govern nanoparticle chemistry and microphysics. For example, she developed a one-of-a-kind single particle mass spectrometer known as SPLAT II. With this instrument, scientists in the lab and in the field can measure simultaneously the size, chemical composition, shape, and other properties of individual particles. The instrument provides data on particles as small as 50 nanometers in diameter. The workshop is occurring on October 25-26, 2010, at the Washington Plaza Hotel in Washington, D.C.